The whole island of Ireland is a wonderful place to visit: you can discover beautiful towns and breath-taking landscapes all around the country. But it is also possible to learn about the rich history of both countries while travelling around Ireland and Northern Ireland. In Ulster, tourists can get a glimpse of the tragic era known as the Troubles, the period of violent conflicts between loyalists and republicans, which is explained in detail in Go English n°91. Let’s discover the city of Belfast through a historical lens. In Belfast, most of the Troubles’ fights took place in one area: the West side of the city, and more precisely Shankill Road and Falls Road. Shankill Road is home to loyalist and Protestant families, while Falls Road gathers a majority of republican and Catholics. 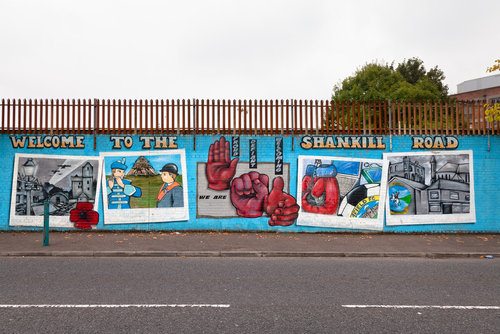 On the North side of the area, Shankill Road is known for having been the meeting point of the Ulster Volunteer Force (UVF) as well as the theatre of deadly attacks. The most tragic one happened in 1993: the Provisional Irish Republican Army (IRA) targeted a fish and chips shop known for being the rally point of Ulster Defence Association (UDA) members. A bad timing of the bomb led to an early explosion, killing eight civilians as well as one member of each paramilitary group, and injuring more than 50 people. A number of attacks also took place on Falls Road: at the beginning of July 1970, a curfew was imposed by the British Army. Around 3,000 British soldiers were deployed in the area to seal off the streets while searching for weapons, prompting IRA members to fight the Army: it resulted in the death of four Catholic civilians and multiple wounded people. Today, both areas are still separated by peace lines: high walls topped with barbed wire, sometimes reaching a 7-metre height. 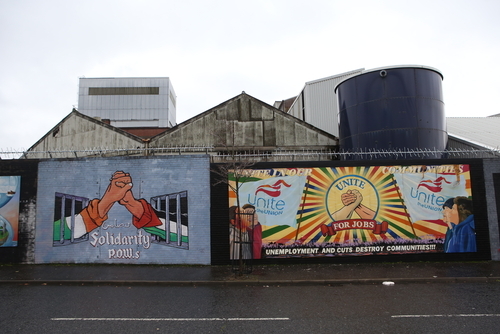 Often compared to the Berlin Wall, the peace lines are now a testimony of the Troubles: they are covered with hundreds of murals, paying homage to heroes and victims from both parties, but also supporting civil right movements all across the world. You can either walk by yourself along Shankill and Falls Road to contemplate the murals, or you can opt for guided tours. Black cabs tours are the most famous ones: your driver will take you through the area and explain the history behind the paintings. You can also choose to go on a walking tour. Many different tours can be found but one in particular allows you to truly get the two sides of the story! Indeed, you can discover Shankill Road with a loyalist local who tells you his vision of things, and then visit Falls Road with a republican who will explain his version of the story. The murals are a good starting point to understand what went on in Belfast but other places deserve a visit too. North of Shankill Road, head to the Crumlin Road Gaol: both loyalists and republicans were jailed there, and some of them were even hanged. You will get a chance to go through the tunnel leading from the prison to the courthouse, where all kinds of prisoners, men, women and children, have been sentenced throughout the years. Another place worth a visit is located at the end of Falls Road: the Milltown Cemetery gathers tens of thousands of graves. 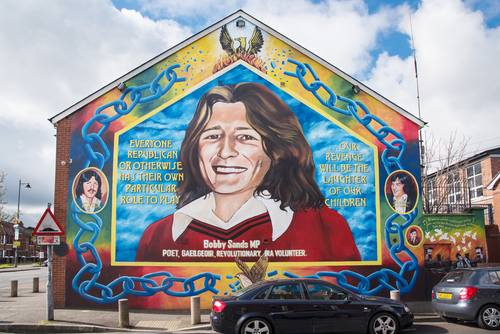 Most of them are those of anonymous Catholics, but multiple sections are devoted to famous republicans such as Bobby Sands, who died in Crumlin Road Gaol after a 66-days long hunger strike. If you are still keen on historical details after these visits, you can head to the Ulster Museum and to the Linen Hall Library in Belfast, where multiple collections are dedicated to the Northern Irish history. You can also extend your trip up to Derry, the city where fourteen civilians were killed January 30, 1972, in what is known as ‘Bloody Sunday’. In Derry you can visit the Bogside, the area where the Troubles were mainly located: as in Belfast, many murals remind locals and tourists of the tragic events. 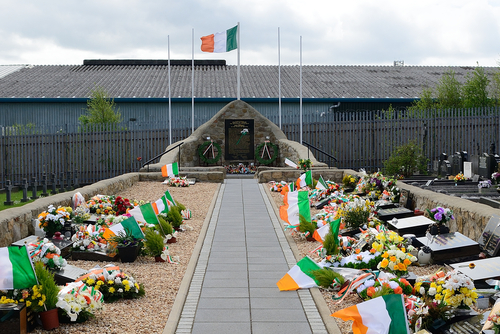 The Bogside is also home to the Free Derry Corner, the Museum of Free Derry and the Bloody Sunday Monument.